Giveaway: Win a Tate's Holiday Cookie & Bar Tower! Earlier this Fall, I was invited to a private cooking class taught by Kathleen King, the baker behind the amazing Southampton-based Tate's Bake Shop--and those amazing super thin and crispy chocolate chip cookies. Those cookies are kind of legendary among folks here in New York City. Back when I worked at Hearst, there was always something of a (stiletto-clad) stampede whenever someone brought a bag of those cookies into the office. Upon meeting Kathleen King--the creator of THOSE cookies--, I told her that a private baking class with her was like my version of a private concert with the Rolling Stones. The class was a kind of book party celebrating the release of King's third cookbook, "Baking for Friends," and I was super excited to have been sent home from the event with my very own copy. It features recipes for all sorts of baked goods, along with beautiful photos, and plenty of baking tips. As a little holiday treat, the folks at Tate's are providing an incredible Holiday tower of cookies and bars for one of my readers. 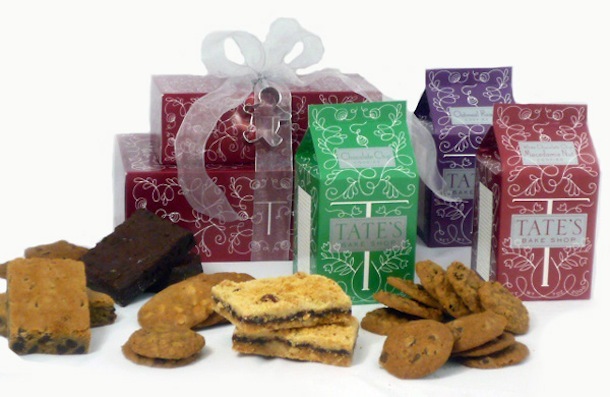 This is a $50 value, filled with an assortment of Tate's most popular cookies and bars. To win, all you have to do is leave a comment below telling me your favorite holiday cookie--to make, eat, or buy! The winner will be selected via Random Number Generator. Your entry must be in by 5PM EST on Thursday, December 14, 2012. US residents only, please.